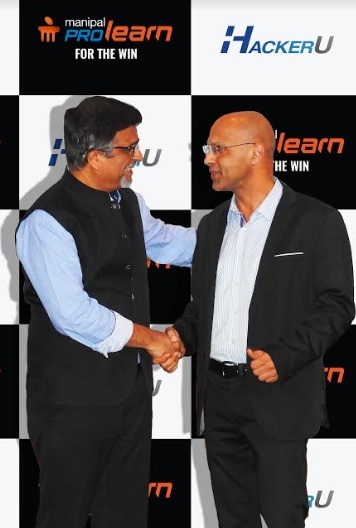 Manipal ProLearn, a leading professional learning platform and a division of Manipal Global Education Services (MaGE), signed a Memorandum of Understanding (MoU) with HackerU, the world's leading Cybersecurity Training company, to launch a Cybersecurity Certification Program. The strategic tie-up aims at skilling professionals in the domain, as per the global industry standards and bridge the huge demand for trained cybersecurity professionals. The program has been developed in Israel, a global tech powerhouse with specialization in security and since the last decade with more emphasis in Cybersecurity. “For industries, cybersecurity has emerged as a key area of priority, as threats emerge from multiple fronts. Our new offering, with the much coveted HackerU, is a one-of-its-kind programme in India that shall enable professionals in India to remain ahead of the curve,” he added. The program intends to provide assured placement assistance for students who complete it successfully. It will be delivered in two modes – the classroom mode (in Bangalore to start with) will be a four-month program. The online program targeted towards working professionals will be an 11-month program. The learners will be trained on Cybersecurity offence and trained for OSCP (Offensive Security Certified Professional) certification – a premium global cybersecurity certification. Cybersecurity is touted to be one of the most critical aspects of 21st century global commerce and politics. India has become the world’s centre for information technology and associated services and boasts a reputation of being at the forefront of software development. With the country taking giant strides towards a digital economy, the risk of large scale cyber-attacks and breaches has increased. For more details, you can log in to, www.manipalprolearn.com. Manipal ProLearn helps working professionals and students enhance their skills and fast-track careers. Manipal ProLearn partners with industry leaders like Google, Sandbox, Chartered Institute of Management Accountants (CIMA) and PEOPLECERT to provide quality courses that add to your skill set. HackerU is a world-renowned provider of Cybersecurity training, knowledge partner, technological solutions, cyber services. With over 23 years of leadership as Israel's Premier IT and Cybersecurity Training institution, HackerU works with its global partners to effectively prepare the next generation of Cybersecurity professionals. To date, HackerU boasts tens of thousands of graduates across the world now working in IT and Cybersecurity. Their success is a testament to our work; they are the reason our experts continue to produce the world’s most comprehensive, market-driven training programs.